5/17/09: this links describes the state legislative process and how the Dade Delegation got behind the issue of saving Hialeah and really working for it. 5/7/09: It looks like Hialeah Park will be saved under new state legislation that will grant Hialeah the rights to run quarter horse racing and have cards rooms, and after two years of racing they can offer Las Vegas-style slot machines. 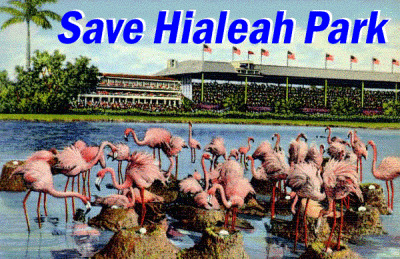 I worked at Hialeah Park in 1971 while I was in High School and It NEEDS to stay there not be torn down, It is a part of the history of Hialeah!